Understanding Traffic Congestion so you can combat it to save on Time, Stress and more for your fleet! How many hours a week do you spend stuck in traffic? The time spent hitting your brakes, inching forward ever so slowly, or at a dead stop altogether adds up by minutes and hours easily and costs much more than just wasted time for fleets. 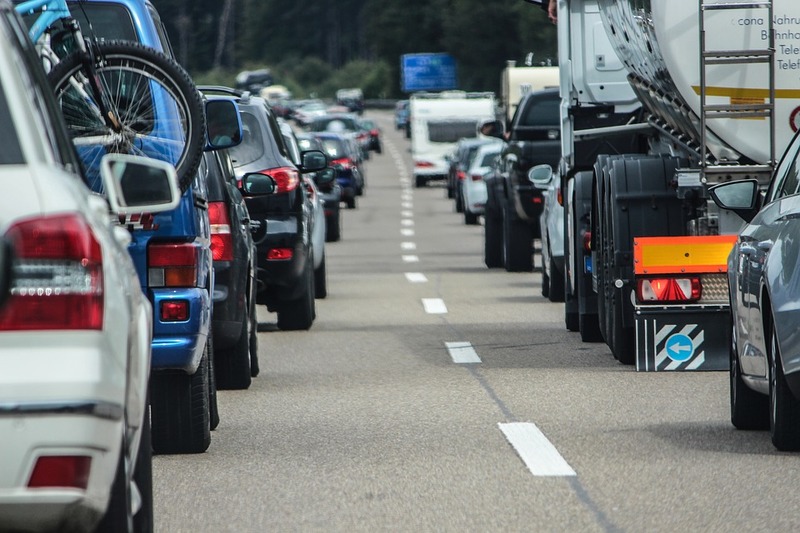 Fuel used idling can add up to a significant loss for companies, and there is research that suggests traffic jams are linked to stress, higher blood pressure, and weight gain, however this doesn’t have to be the case for your drivers. To be able to combat traffic congestion and the costs and health issues associated with it, the types of traffic congestion and categories that cause it must first be explained to get a better idea of the ways to beat it. There are two types of traffic congestion – recurring and non-recurring. Recurring traffic congestion happens on a daily basis due to the lack of capacity of the road. Simply put, there are more vehicles travelling on the road than the road can physically fit. Non-recurring traffic congestion on the other hand does not necessarily occur on a daily basis, as it consists of temporary disruptions such as bad weather, vehicle collisions and construction. The four main categories for causing traffic congestion are: Environmental (non-recurring), Mechanical (non-recurring), Human (non-recurring), and Infrastructure (recurring). Environmentally caused traffic congestion occurs because of weather, from rainy or foggy weather, to the extreme snowstorms that stop drivers in their tracks, weather can have an uncontrollable effect on not only traffic but road conditions as well. It’s not just the large storms that can cause traffic headaches; even a gentle rain can have a compounding effect on traffic if all drivers slow down together. Mechanically caused traffic congestion can sometimes fall under the human-caused category if a mechanical breakdown was caused my improper vehicle maintenance, however, it could also happen as a result of a sharp or large object on the road that is unavoidable. The biggest traffic congestion headaches that can happen as a result of a mechanical breakdown is when other drivers merge into surrounding lanes, creating a traffic snarl, instead of stopping to allow the broken down vehicle move to the shoulder of the road so traffic can resume a steady flow. While in some cases a driver may have been able to prevent the issues, even some of the most seasoned and responsible drivers have found themselves in these situations. Human caused traffic congestion can be as a result of distracted driving, drunk driving, drowsy driving, or emotional driving. The most common traffic congestion caused by humans is known as “phantom traffic jams”, which occur when drivers make quick decisions and engage in behaviours like last minute braking, causing a ripple effect. Depending on other traffic conditions, this one action can slow traffic in that lane and the surrounding lanes or area for hours. These situations are known as “phantom traffic jams” because as drivers get through the sluggish spot, it will seem as though absolutely nothing caused the slowdown. The effects of a last-minute braking become much worse when a collision occurs, even something as small as a fender bender. If a collision does occur, the time getting the involved vehicles off the roadway causes even more residual traffic, and traffic slows down even worse when “rubbernecking” (when drivers slow down to look at an accident) occurs. Infrastructure caused traffic congestion could again, like mechanical, be argued to be human-caused, however while humans created it, infrastructure is so vast and the world around it changing so rapidly, that it’s not necessarily the fault of engineers who didn’t foresee the demands which would be put on the roads at exponential rates. From potholes that cause slowdowns to bottlenecks in areas that simply out-populated their roadways, infrastructure is a hidden troll that amplifies traffic problems in many urban and suburban areas. Ironically, efforts to improve infrastructure and eliminate traffic congestion issues through construction can often cause significant traffic congestion. With so many ways traffic can go wrong; it can seem daunting trying to figure out a way to avoid the hiccups that are sure to pop up in your daily commute. The task can seem even more intimidating for fleet managers who can have fleets of all sizes on the roads at any given time. So how can you avoid traffic congestion? While some factors are outside your control, Geotab’s GPS tracking system technology provides a modern-day solution to the traffic challenges your fleet may face, saving your company time and money lost spent sitting in traffic and saving your drivers the potential health risks linked to traffic jams. Not only can Geotab’s GPS tracking system track fuel usage, it also allows fleet managers to identify and reduce unproductive miles, and see how much time is spent idling so they can better manage routes. If you are interested in saving your business money and time with Geotab’s GPS tracking system, contact us today!